Ordrered these end tables for my daughters new apartment. 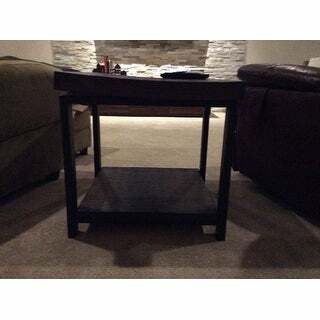 These end table are very solid and sturdy. Great quality! I am very happy with my purchase! 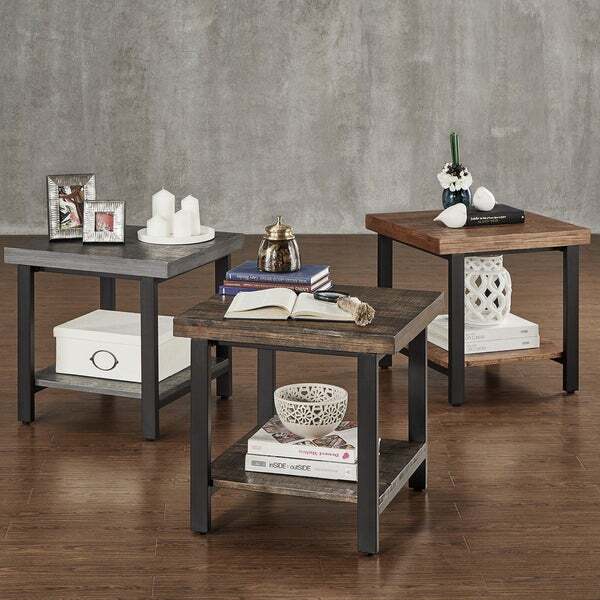 The Cyra end table from iNSPIRE Q Classic has a solid industrial aesthetic that lends itself wonderfully to absolutely any space, while providing the perfect space for display items. The industrial design is shown in the mixed material construction. As a companion to a bed or sofa, this versatile piece is a marvel of durable creation and attractive finish, appealingly simplistic, and marvelously timeless. At iNSPIRE Q, our designer-curated lifestyles reflect current trends and timeless essentials, giving you the know-how to achieve your vision. With diverse style inspirations to choose from, you'll be able to find the one that speaks to you-or mix and match across collections for a style that's all your own. Whether you're cool and contemporary, retro, free-spirited, vintage, or classic iNSPIRE Q is here to help you achieve the home of your dreams, every step of the way. Be sure to explore the six style inspirations: iQ Bold, iQ Modern, iQ Classic, iQ Artisan, iQ Junior, and iQ Oasis. These tables have some weight to them. I purchased the brown ones and they look great! I just wish I could get the brown coffee table with them, but it is not available. I was so disappointed with this table. The base is sturdy, but the top looks plastic. I think there is wood underneath, but the "reclaimed wood" is not that at all. It looks more like molded plastic. It'll be too expensive to ship back, so I guess I'm stuck with and the matching sofa table. I ordered these tables not knowing what to expect, to be honest. Some reviewers didn't love the finish of these tables, and others didn't mention it. So with some trepidation, I opened the box and got to assembly. I was pleasantly surprised to discover that these tables are SOLID, heavy-duty, and appear to be well made. As for the finish of the wood, I admit that I was expecting to be disappointed based on one reviewer saying they looked plastic. Aside from a "satin" finish on the wood surface, there is nothing at all plasticy to me about these tables. I had been holding off purchasing the sofa table to match until these arrived and I could decide for myself, but I am now going to order with nothing to worry about. If you think you are getting $**** end tables for this price, you might be disappointed. But in my opinion, these tables are VERY well worth what I paid for them, and I am completely happy. I cant say enough how much I love the iNSPIRE Q brand. Every product is a solid piece of furniture thats easy to assemble and great to look at. These were no exception. They look fantastic. 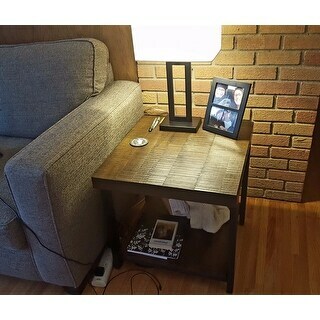 This end table was easy to assemble and looked just as pictured. It’s a substantial, heavy casual end table. Upon arrival there was no damage, however...One month after assembling, there was a huge flaw. 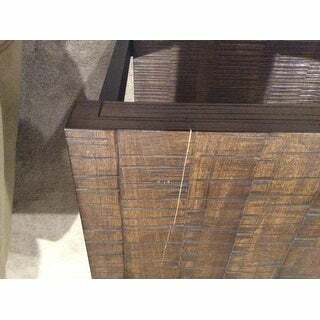 One entire side of the end table top bent—upward, breaking away from the pressboard inside frame. This occurred over a period of just two days! We have no idea what would cause it to do this. No pressure was exerted on it from either the top or bottom. Assume it has something to do with low humidity and dry heat with the onset of winter. Anyway, the good news is that I contacted Overstock just before Christmas and the replacement top came within a few days as promised. Very pleased with customer service so far. We let the new top temperature acclimate before attaching to the old base. Assuming what happened was a fluke, I’d give it 4 stars as well as 5 to customer service. Now if it happens again.... Well it happened again. This spontaneous crack in third photo happened when there was absolutely no weight on the table. We just heard a large pop noise. So I can not recommend this product at all. Changing from 5 to 4 To now 1 star. Although we are happy with the sturdy build, we are not at all happy that the "wood" portions are plastic . 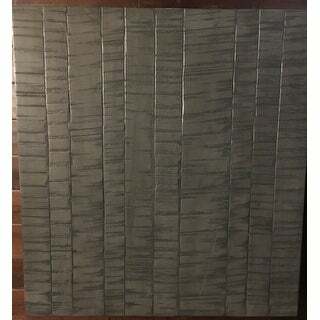 . . the description is misleading, stating a "Reclaimed finish" which leads one to believe that it's a wood product, finished to give it an aged look. Naughty, naughty . . . These side tables are very sturdy and look very nice. We purchased the "brown" option and it is a deep rich brown. The tops are uneven in areas as they are a rustic style. This does not bother me at all. We are using them as bedside tables in my rustic themed bedroom. Not particularly difficult to assemble and the stickers come off fairly easily which is really important to me. I like that it has the lower shelf as well for additional items to keep on hand. I received a table that looks different than the one pictured. Very disapointed. 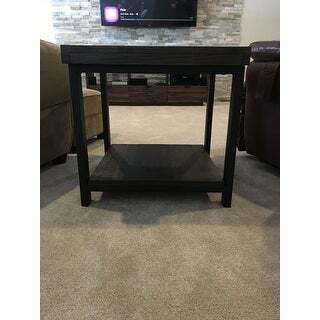 These end tables are fantastic!! Look great!! Great product easy to put together and nice looking wood; happy over all with purchase; would recommend to others. Also arrived earlier than expected! 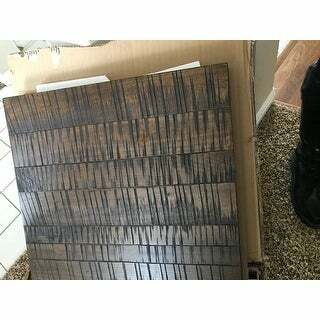 Very disappointed as these tables ( I bought 2) are not even close to the texture in the pictures. Nice table! Looks as pictured, sturdy and good quality. Great for a rental or to fit within a budget. It can go well with rustic, modern and traditional decor. We love the tables. They came in a timely manner, and looked exactly as the picture! Thank you so much! 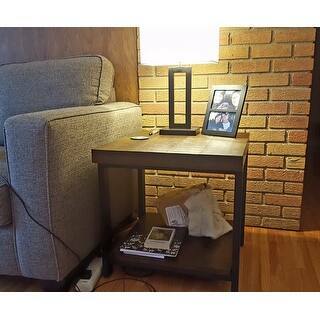 This is a beautiful end table that I've actually been using as a nightstand. My one complaint is that the wood surface cracked, and while not especially visible due to the markings and natural-looking wood grain, I'm disappointed it didn't end up being as sturdy as it looked at first. These are very sturdy tables. I was quite pleased overall. Looks amazing with the coffee table. I love it! Good quality. Sturdy. I put together without backing and I love the look. A little larger than I imagined when measuring but still fits well in a small seating area. No damage to wood and I like the contrast of wood and metal. One of these tables came without predrilled holes on one leg but I fixed the problem myself and drilled it myself. Was kind of a pain because it is metal but i didn't want to deal with the return and exchange. Mfg needs to check their products before it leaves warehouse. Like the look of this table. Not real wood but is easy to wipe clean. A little larger than I wanted but we moved everything over and it fit fine. Good for the price. "I would like to order the brown finish. Currently, the oak and grey finish are the only options available. Please advise." The brown finish is currently out of stock. "Won't let me order the brown reclaimed wood end table. Keeps going to option for grey or oak. I want the dark brown. " The brown finish is not currently available. 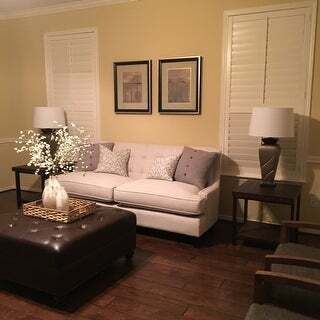 "There are two "brown" tables shown in the picture, but only one brown option available to order. Which one is currently available...the dark brown or the lighter brown?" The brown finish and gray finish are both available but the oak finish is out of stock. Please click on the smaller pictures to see details on colors. I hope this helps.. The brown finish is the one front and center in the picture...the darker brown. "Does this come already assembled? I cannot find anything on my iPhone!!! " No. You have to put together. But super, super easy to do....took me less than 5 minutes and I'm not a handy person..
No, but it's very easy to assemble. "does the brown finish match the rustic brown finish on other Tribecca myra coffee table?" Yes, the finishes should be the same. I ordered the end table, coffee table, and tv stand and they all match perfectly. 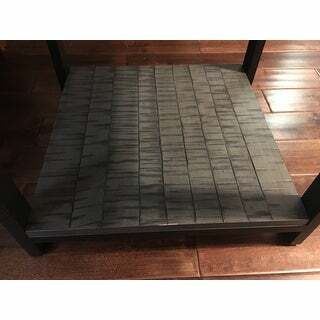 "What is the height, width and depth of this table as a whole"
This table is approximately 24 inches wide x 22 inches long x 22.25 inches high. "When will the "grey finish" be available to purchase?" The grey color option is expected to be back in stock by the end of June.